This limited edition and numbered pewter buckle will be a valued keepsake, whether worn or mounted on an award plaque or desk set. 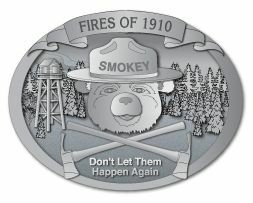 This buckle commemorates the fires of 1910. Don't let them happen again! Size is 3 1/4" by 2 5/8" Made in the USA.